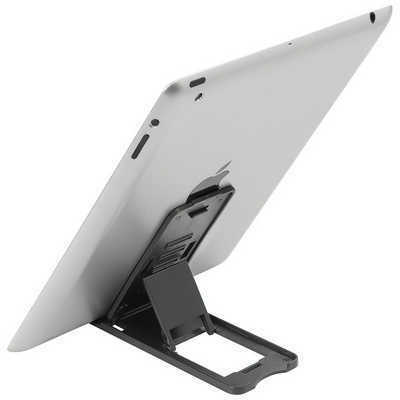 Description: This handy tablet stand is made from plastic and folds flat for easy storage in your compendium or bag then opened when you needed to hold your tablet at just the right angle. Features: Packaging: Polybag. Colour: Black Material: Plastic Product Size: Folded: 127mm(w) x 57mm(h) x 8mm(d). Freight details : 500 per carton, 16.5kgs, 47.5 x 28.5 x 15.5cms; Decoration Type(s): Colour Print / Full Colour Print. Decoration Area: 25mm(w) x 20mm(h). Price includes : 1 Colour Print. Setup is included.